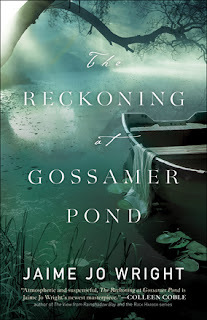 I've never read a book quite like The Reckoning at Gossamer Pond. Moving between two centuries was fascinating but a bit difficult for me. However, the story is well written and interesting. Jaime Jo Wright's research into old-time tent revivals adds a mysterious and at times frightening aspect to the story. The twin revivalists, based on real people—provoke thought about how the approach of teaching Jesus matters and adds a dark note of suspense to an already mind bending story. I loved the part of the story where redemption steps into the lime light. Annalise's story made me want to turn the pages faster to see what happened next. The characters learn some hard lessons, but in the end..well I can't tell you that. You'll have to read for yourself. If you enjoy suspense and mystery mixed with history, you'll want to read The Reckoning at Gossamer Pond. I received a complimentary copy of this book from Bethany House by way of NetGalley. Opinions expressed in this review are completely my own.